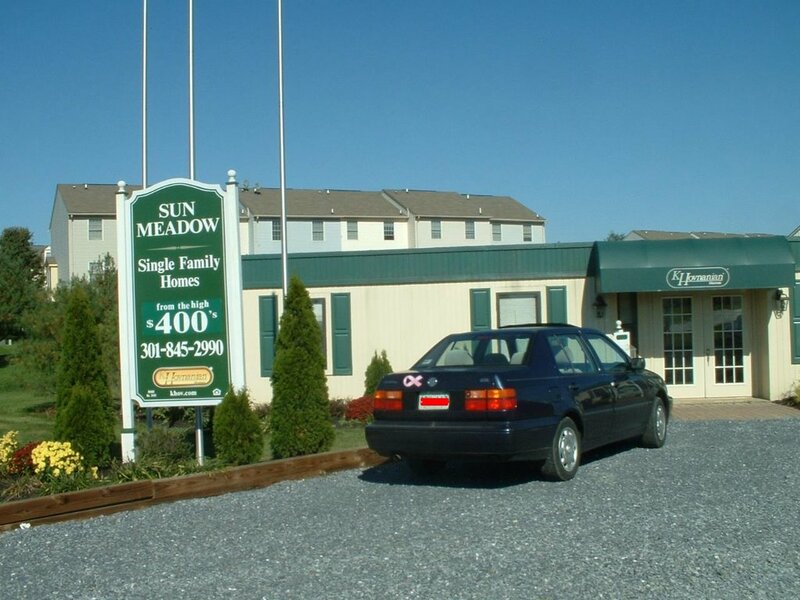 North of Frederick, Maryland is a new housing development that is called Sun Meadow. 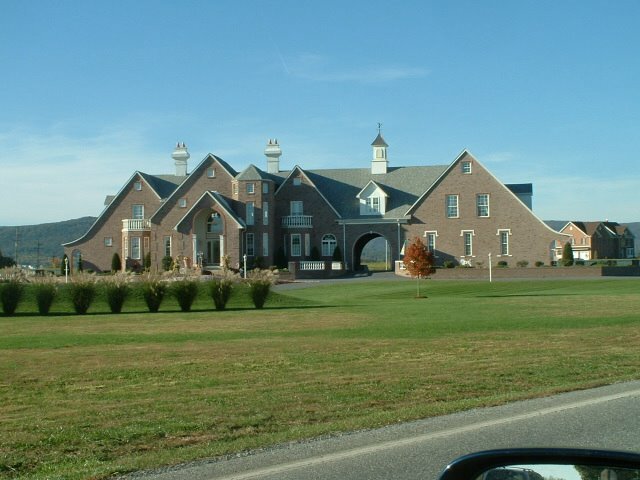 It is being developed by K Hovnanian Homes. 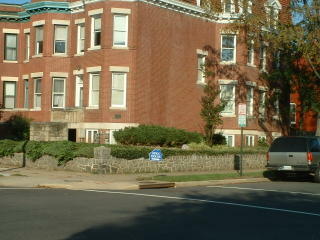 Frederick is considered part of the Washington, DC - Baltimore metro area. Notice the upper 400's located on the big green sign. The green board with the 'upper 400's' was added later. 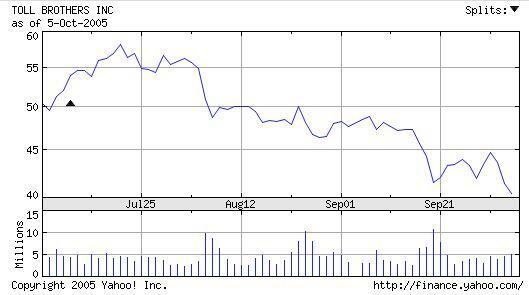 At the beginning of last year it was upper 300's. 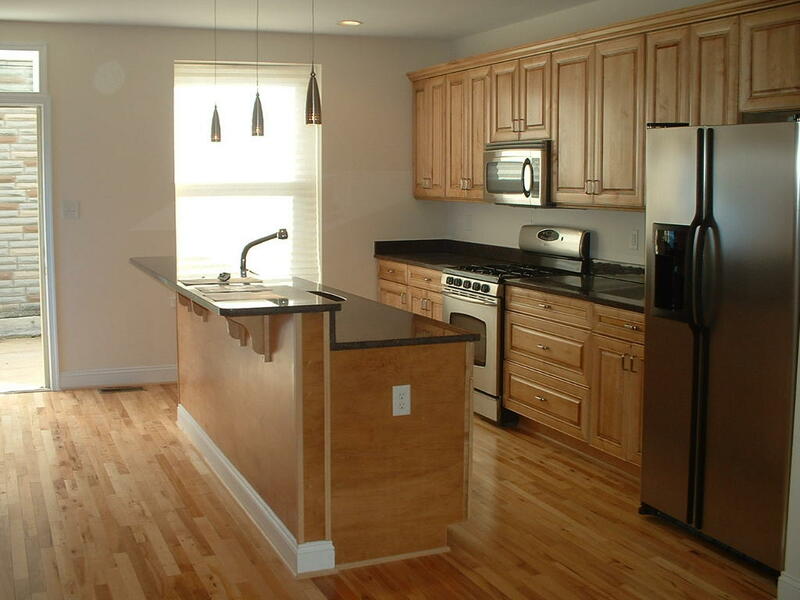 However, of the 8 models available at the homebuilding site only one ( yes one ) is priced at less then 500K. That one model 'The Newbury I' is priced at 495,990. 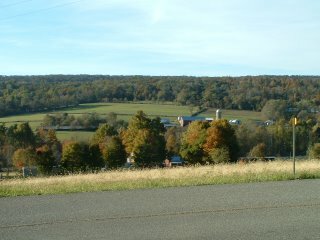 Image of home in Sun Meadow on the left. 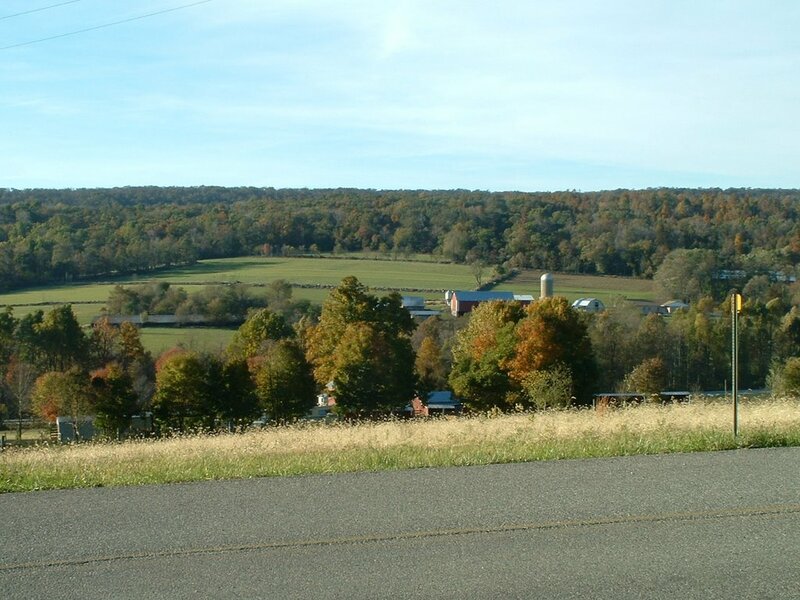 Notice the lack of mature trees. My friend and I were taking pictures of the sales trailer. One of the sales people came out and asked us what we were doing. My friend quickly said that we were doing research on land development. I asked him what the MBHR 3149 meant on the green sign. He did not know. Shows how much he knows. Many low-to-moderate income earners have talked themselves out of owning a home. "A foothold in real estate is a foothold," says Bank of America's Jackson. "Ownership has to start somewhere, and we need to let people know that it's OK to look around at the possibilities of owning rather than renting." A foothold is not inherently a positive thing. Without a safety rope a foothold here ( on the left ) would be a very scary thing. 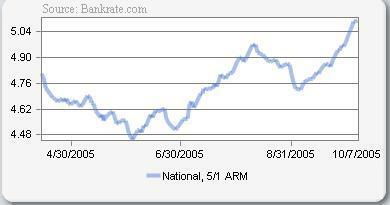 For many, having an ARM and Interest Only loans are like climbing a mountain with an avalanche coming downhill. A foothold here is highly problematic. The members of the Mortgage Bankers Association have done enough damage peddling their toxic loans to ill-informed or greedy homedebtors. They should stop trying to find new groups to lure with toxic mortgages and instead focus on raising lending standards. 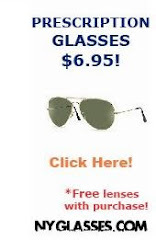 Does it say "New Price"? (October 21, 2005) -- Most of the homes on the market in Los Angeles and Orange counties in California for $500,000 or less fetched their asking price or more during the second quarter, according to statistics compiled by Real Data Strategies. However, sellers in the most affluent neighborhoods—with homes priced above $750,000—have been forced to shave 5 percent to 10 percent off their asking prices and wait weeks to find a buyer. Real Data Strategies President Patrick Veling attributes the price reductions to a 40 percent jump in inventory in the two counties over the past year. Analysts are closely watching to determine whether the cuts are seasonal or indicative of the start to a long-term decline in the housing market. Wow. It is surprising that this was actually published in Realtor Magazine. When Real Estate Goes Pop. The National Association of Realtors warned in a news release that a change to the Mortgage Interest Deduction could reduce home prices by 15%. Home prices, particularly in high cost areas, could decline 15 percent if President Bush's tax reform panel'ss expected recommendation to convert the mortgage interest deduction (MID) to a tax credit gets implemented, said Al Mansell, president of the National Association of Realtors®. Speaking at the opening session of the 2005 REALTORS® Conference & Expo here, Mansell said that if the MID were changed, the typical homeowner could lose $20,000 to $30,000 in housing equity. Housing is the engine that drives this economy and to even mention reducing the tax benefits of homeownership could endanger property values. The tax deductibility of interest paid on mortgages is both a powerful incentive for homeownership and one of the simplest provisions in the tax code. It should not be targeted for change, Al Mansell said. "NAR will continue to tell Congress that Realtors® strongly oppose any attempts to alter the current tax treatment of mortgage interest." Eliminating the mortgage interest deduction would hurt middle-income families the most, he said. According to IRS tax return data from 2003, 52 percent of the families who claim the mortgage interest deduction have household incomes between $60,000 and $200,000. The president's tax reform panel will issue its proposals next week. It is expected to recommend converting the MID from a deduction to a tax credit; reducing the $1 million cap on mortgages to the local FHA loan limit (which can be as little as $170,000 and no more than $312,000 in high cost areas such as Alaska, Hawaii, Guam or the Virgin Islands; the current cap has been in place since 1987); eliminating any deduction or credit for second homes; repealing the deduction for property taxes, as well as other state and local taxes; and raising the amount of gain to be excluded on sale of a principal residence, but reducing the frequency in which the exclusion can be taken. NAR sounded desperate. Al Mansell, president of the National Association of Realtors®, stated "These proposals are startling. We communicated immediately with the chairs of the Tax Reform Panel and expressed our shock at their proposals." I totally support "eliminating any deduction or credit for second homes," as well "reducing the $1 million cap on mortgages." Too much federal tax revenue is lost on deductions for second homes and expensive homes. Over at The RealEstate Bloggers there is an solid post about the monthly rent to price ratio. Check it out. For the townhouse I live in it is 260 ratio ( 600K / 2,300 ). Michael K. Evans writing for Industry Week in an article titled 'Evans On The Economy -- Ignore The Bubble Babble' writes: "U.S. housing prices, on average will rise 2% to 3% next year, the same as the rate of inflation. In 2007, they will rise 4% to 5%. These projections are obviously well below the average rise in housing prices of the past four years" We will see if you are correct. U.S. housing prices in the bubble markets will see price declines. I expect the average US average home price will fall slightly between 1 - 3%. Many, areas in the country are not in a housing bubble. Evans continues and writes "the bubble-bursting scenario being put forth by many alarmists." Most os us bubbleheads are no alarmists, but rather realists. The tremendous price appreciation seen in the past 5 years in the bubble markets is unsustainable. Prices will decline. In California home prices " have more than doubled since late 2001, increasing pressure on home buyers, who needed a minimum household income of $133,800 to buy a home at the August median price of $568,890, the California Association of Realtors said in its report. That meant that only 14 percent of households could afford the typical home, down from 18 percent a year earlier, and the lowest level since records began in 1989, the report said (Reuter, Oct 6th). Some people would argue that while national average prices won't decline, there will have to be some sharp corrections in the areas of the country where prices have doubled over the past four years. Maybe that's true in Las Vegas. But looking at prices in the other areas that have posted 100% increases -- Boston; New York; Washington, D.C.; South Florida; Los Angeles and San Francisco -- we find basically the same phenomenon. High housing prices have caused many people to move to the outer fringes of these areas, with commutes of an hour and a half to two hours each way no longer uncommon. Suppose that housing prices in closer-in areas did start to decline, either because would-be buyers decided they couldn't afford the asking prices, or existing homeowners started defaulting on their funny-money mortgages. There is an enormous reserve of buyers just waiting to snap up these properties and reduce those tortuous commutes. As a result, prices will decline hardly at all even in these currently "overpriced" areas. It is certainly true that if home prices decline in the inner areas of metropolitan areas some people in the outer areas will buy. However, if home prices fall in the inner areas prices will be falling in the outer areas as well because these housing areas are competing against each other for buyers. Interest rates are rising considerably. According to Bankrate.com " Mortgage rates rise for seventh straight week." We agree about Las Vegas home prices. However, next year we will be seeing actual price declines in may other markets including NYC, Philadelphia, Baltimore, Bakersfield, San Francisco, LA, Boston, Miami, Jacksonville, Tampa - Saint Petersburg, Bradenton, San Deigo and others. Dear Mr. Snow, I read on your web-site that "The American economy is the envy of the world." My wife and I are both teachers and we are expecting our first child in May. My concern is that I have read many reports that a recesion in right around the corner and that school districts will be forced to lay of teachers. Is the Bush ecomomic plan have any provisions that will keep this from happening. Thank you for our service to our country. John Snow: Hello, Daniel, and thank you for writing in with your story and this very important question. There is flatly no reason to be worried about a national economic recession in the near future, and I hope I can put your worries to rest. Making sure that the American economy remains the largest, strongest and most resilient in the world has always been a priority of President Bush. His sound fiscal policies enabled us to recover from economic challenges and today we are on a solid path of economic growth. In order to maintain this economic strength the President is working to keep taxes low and spending restrained. He is also addressing long-term economic challenges like our dependence on foreign oil and the need to prepare future generations of American workers for 21st Century jobs. He’s also confronting the problems facing our entitlement programs and making sure that American businesses have the option of doing business with the potential customers that live outside of the U.S. – that’s 95 percent of the world’s customers, by the way, since the U.S. only represents about 5 percent of the world’s population. You have every reason to be confident in the President’s ability to keep our economy strong. John Snow is a proffessional liar. John Snow writes "There is flatly no reason to be worried about a national economic recession in the near future." How about the following concerns? 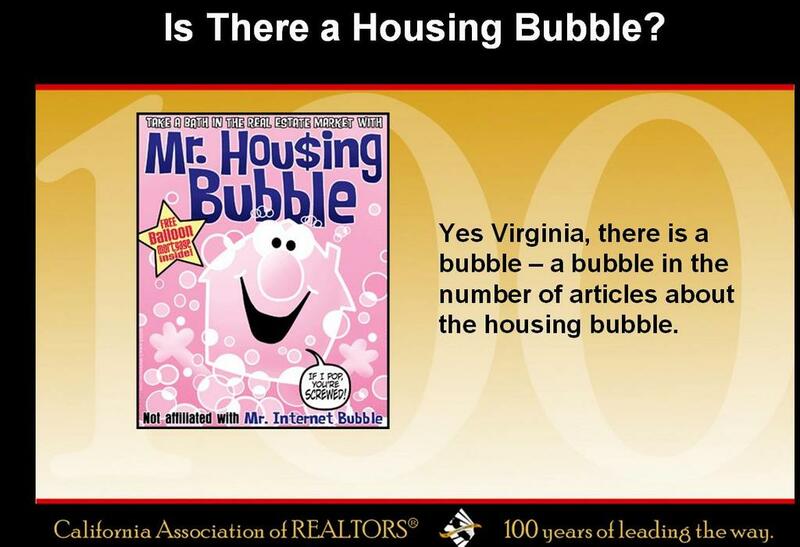 John Snow: While we should always be on guard for “bubbles” or areas where economic activity doesn’t correspond with underlying economic fundamentals – as was the case with stock market bubble of the late 1990s – I don’t think this is the case with America’s housing market. For one thing, when we talk about our housing market, we’re really talking about hundreds of housing markets, each with different characteristics, in local markets. For the most part, strong economic fundamentals are contributing importantly to the housing boom in many local markets. Some of the factors that have contributed to a housing boom include low mortgage rates, rising employment and incomes, a growing population and a limited supply of homes or land in some areas. We’ll continue to keep a close eye on the health of our housing market because it is so important to our national economy and to the wealth and prosperity of millions of American families. John Snow is right that low mortgage rates and a growing population contributed to housing price apprecaition. However, rising incomes are a crock; real wages have been basically stagnant for the last few years. Neverthless, the factors do not add up to the unprecedented price appreciation seen in the bubble markets in the past 5 years. Snow is out of touch with Americans. A challenge? Is this some sort of video game? These are real people. Snow, when was the last time you filled up for gas? Paid a heating bill? Do you know what it is like to live on 20,000 a year in Massachusetts and face high gasoline prices and home heating costs during the winter? 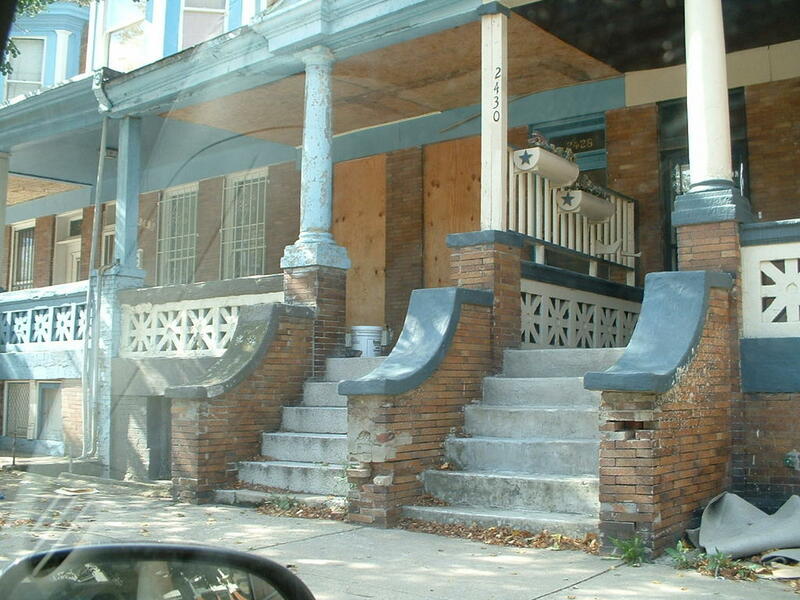 The Commerce Department said Hurricane Katrina had a minimal impact on new residential sales for September. While sales rose, the supply of homes available for sale shot up to a record 493,000 at the end of September, surpassing August's high of 478,000. At September's sales pace, that represented a 4.9 months' supply. 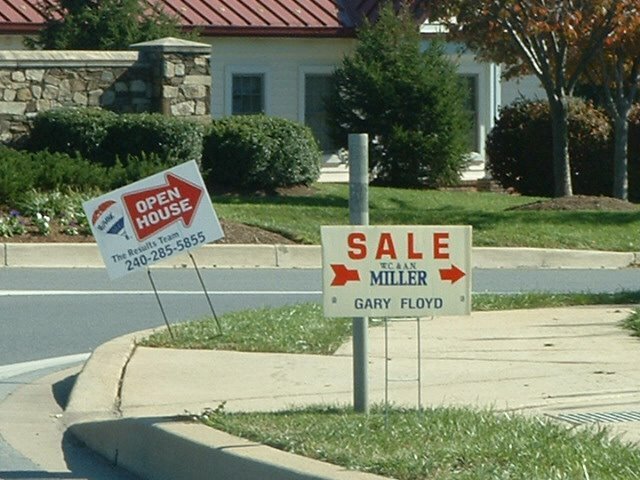 The median home sales price fell 5.7 percent to $215,700. 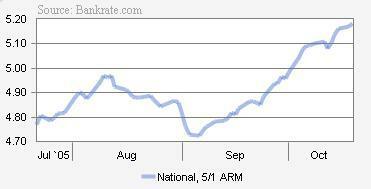 Also the Mortgage Bankers Association said mortgage applications fell last week to a six-month low. Regionally, new home sales in September jumped 24.9 percent in the Midwest and 5.6 percent in the South. But sales tumbled 20 percent in the Northeast and 11.8 percent in the West - the regions that have posted the double-digit home price appreciation that many economists think is unsustainable (MSN Article). The Housing Report is available here. Sure. Keep drinking the kool aid. Actually, I think Lereah knows better. He is one of the people mixing the kool aid. WashPost "Only the Good Buy Young"
Sometimes, the risk seems too great. Jeremias Alvarez, 26, engaged in some fancy financial footwork to win a contract over the summer on a $450,000 two-bedroom condo in the District's rapidly gentrifying U Street corridor. He planned to finance 100 percent of the cost with no money down. But that meant his closing costs totaled about $15,000, and he was considering borrowing against his retirement plan to pay for it. That plus renting out a bedroom and maybe even getting a part-time job to supplement his government salary. But then, in a moment of clarity, Alvarez pulled out of the deal. His real estate broker, the seller, everyone was pushing him to buy. But he just wasn't sure prices would keep going up, and if they didn't it would be a financial disaster. As for Newland, he's still looking. He said he has been outbid more times that he'd like to share. "I know I can't really afford a mortgage," Newland said. "But I also know I have to buy a house." You are still a human being if you do not own or seek to buy a housing unit. Do not commit financial suicide for housing unit. If you cannot afford it the do not succumb to the herd mentality just so you can buy. Already, there are some signs that the Washington market could be slowing down, and some analysts think it peaked months ago. If owners try to sell their homes when the market has cooled off, they could wind up owing more than it's worth. The peak has been reached in the Washington, DC area. Very small price declines are now occurring. 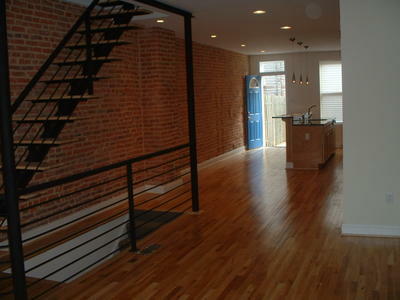 A buddy of mine said he was trying to sell his 300K condo in DC. He has already lowered his price thrice ( three times). No takers yet. 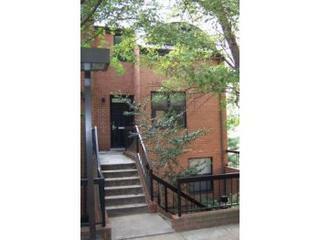 I suggested he lower the price once more and emphasize the solid condo managment in his building. Graph showing who is buying. Data from National Association of Realtors Study. Bernanke was named as the Greenspan successor to the Chairman of the Federal Reserve. Greenspan will retire on January 31, 2006 . For more information on Ben Bernanke check out Wikipedia. What will this mean for the housing bubble? The Washington, DC metro area has experienced rapid price appreciation of 26% over the past year and 101% over the past 5 years ( for period ending June 30, 2005, OFHEO.gov). In addition to the usual factors contributing to the housing boom the DC area has had strong job growth due to increased spending by the federal government. 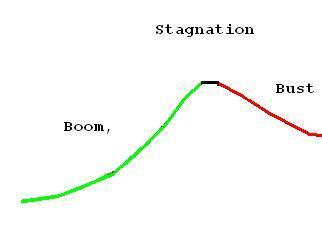 However, the boom period is over. The housing market started stagnating a few months ago and is now experiencing very small price declines. Inventory has rapidly increased throughout the metropolitan area. 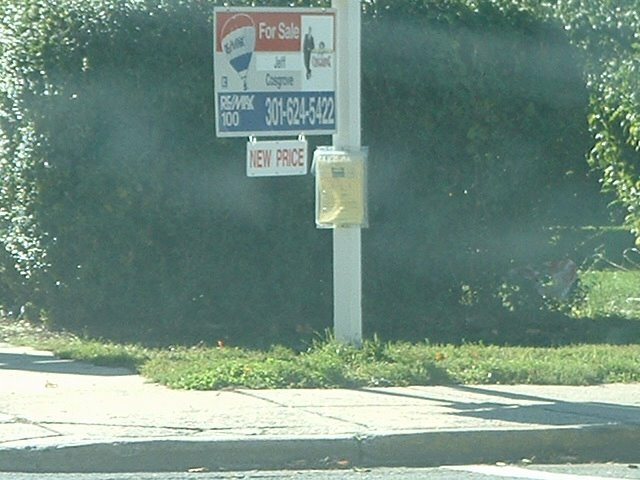 According to this article by Reuters "After hitting a high in May, the number of contracts in Washington D.C. and its surrounding Virginia areas of Prince William, Loudoun, Fairfax and Arlington counties have fallen by about half, according to the Greater Capital Area Association of Realtors. Meanwhile, inventory of houses for sale has doubled and in some cases tripled, and homes are staying on the market 30 percent longer." The high price preoperties are sitting longer. "Anything over $500,000, especially in the suburbs, is just sitting." said Gay Ruth Horney, of Long & Foster Real Estate Inc. in Maryland's Montgomery County, where inventory rose 5 percent and homes stayed on the market 7 percent longer than in September 2004. "Would-be landlords have discovered that they are not able to achieve rents high enough to cover their mortgages. she said." Today, I went for a drive through the District of Columbia (DC) and also walked the streets. There were many houses available for sale. On the 1300 block of Taylor Steet NW there were three available houses for sale at 1307, 1301, and 1341. The house on the right is located in the city proper in a alright neighborhood called Brightwood. The address of the house is located at 1444 Whittier Place NW. The MLS is DC5419971. 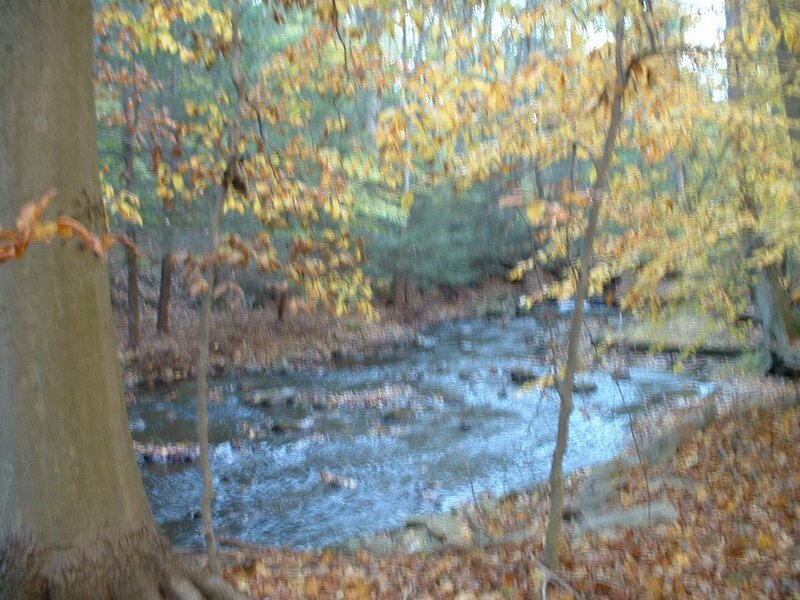 It is a 3 br 2ba house located on .11 acres. The house is being offered at 650K. Will it sell in a reasonable amount of time? Nope. Inventory is rapidly increasingly in the metropolitan area. In Fairfax County (western suburban county), SFH inventory went from 900 in March to 3300 in August (the latest month they have the data for). 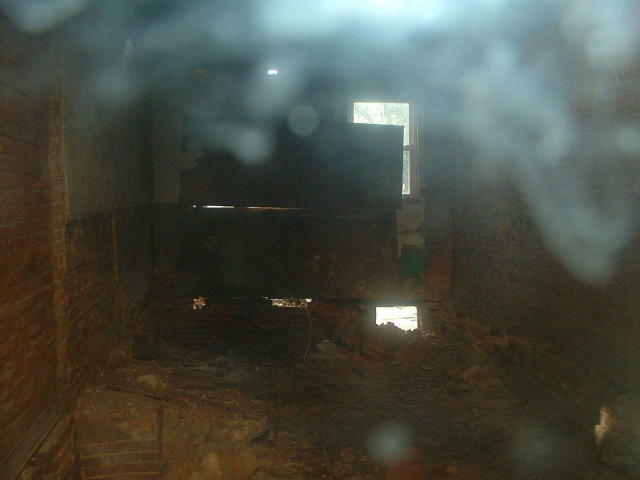 Furthermore, according to DC20009Guy who has been tracking listing for sale via ZipRealty. Listings in the 20009 zipcode ( DC ) are up 159% and DC as a whole is up 68% since Sept. 7. That is incredible. DC2009Guy add "20009 includes Dupont Circle, parts of Adams-Morgan, U Street, and Logan Circle. 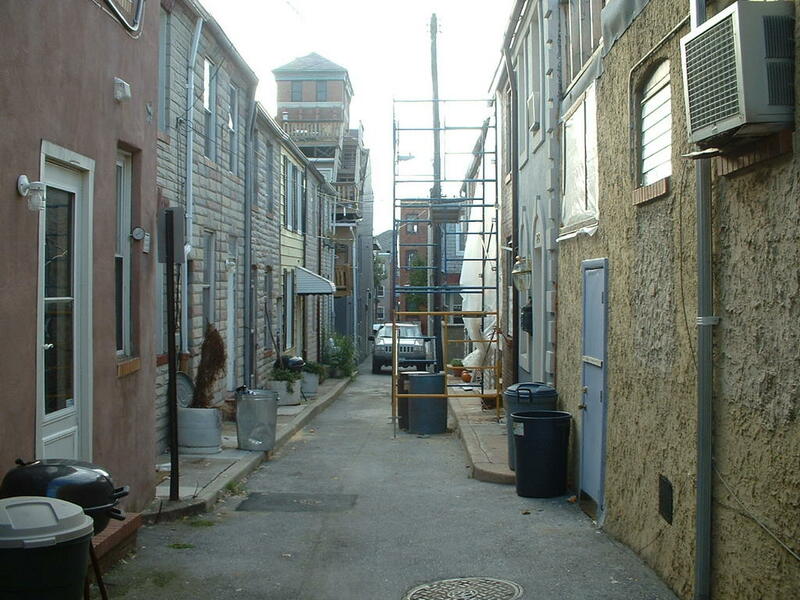 These areas have seen incredible gentrification (and crazy appreciation) the last few years. For example, my partner and I recently looked at a $499,999 "loft" which was basically just an efficiency." Due to the rapidly increasing inventory and the changing buyer mentality sellers have been forced to either reduce prices or wait longer for a sale. The market is seeing an increasing amount of "price reduced," "huge price reduction," "price reduced to sell," "25,000 reduction," "price reduced. 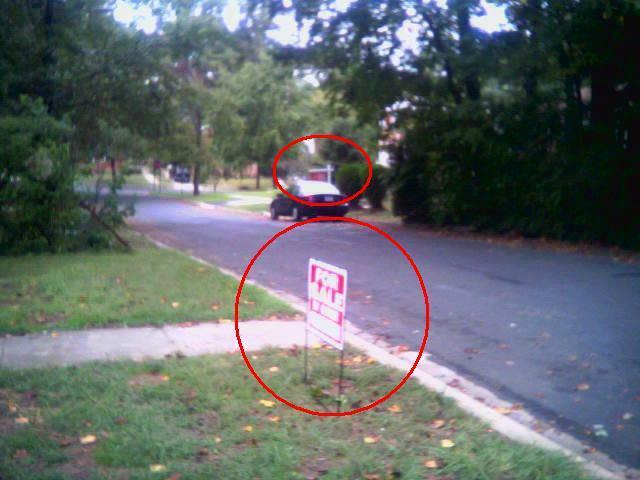 Must sell," "way below market value", and "just reduced"
The housing market continues to weaken in the DC area. Inventory is surging. The boom is over. 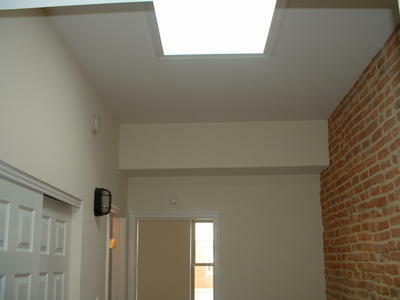 The townhouse located at 1668 Oak Street NW is for sale at $621,000. The ad states "This 2 Â 3 BR, 2.5 BA townhouse condominium is equipped with all stainless steel appliances including a thermoelectric 12-bottle wine cooler. Three levels with dramatic views of Rock Creek Park, hardwood floors and fireplaces in both the living room and master BR complete this unique property. Within walking distance to the Columbia Heights metro; minutes to Adams Morgan and downtown. Assigned parking space included and guest parking access. A SIMILAR UNIT SOLD FOR OVER $630K!!!!! " I checked the DC Real Property Website and found out that the property was sold for 312,000 on 3/28/2001. So the price this townhouse is being offered at is basically twice the price that it was bought for 4.5 years ago. Wow. I usually find open houses off of Craigslist.org, from Long and Foster.com or from simply crusing around town. Which neighborhood should I go tommorow? Any open houses? I am open to suggestions. Thanks. The CNN article titled 'Housing bubble may lose some wind' is problematic for many reasons. With the popularity of exotic mortgages, it's never been easier for homebuyers to afford their dream house even if it's out of their preferred price range. But in many markets home prices have gone up tremendously, thus negating the 'affordability' effects of these exotic mortgages. Additionally, these exotic ( aka toxic) loans sacrifice long term affordability for short term affordability. the market and sellers could demand higher prices. He added while there has been "an explosion in first time homebuyers using no-down payment loans" or other exotic mortgage products, he didn't think there was necessarily a direct correlation between the availability of flexible home financing products and the housing spike. Where is the counter agrument to Walter 'shill' Molony? They say "he didn't think there was necessarily a direct correlation?" He probably hardly ever thinks. NAR should have just hired a parrot to be spokesperson. The parrot could be placed in David Lereah's office ( chief economist of NAR). But don't expect a free-fall in housing prices, experts said. Ellen Bitton, president and chief executive of Park Avenue Mortgage Group, said the market is more likely to undergo stabilization rather than any major decrease in valuation. "People who have only been looking at the real estate market in the last few years think prices have to increase by 10 to 20 percent a year," she said. "But that's a frenetic market, not a normal market." She estimated that housing prices would return to a more stable 3 to 5 percent growth rate once it returns to a buyers market. "But we have a way to go before we see that," she added. CNN does not mention the possibility of significant price declines in the bubble markets. Where is a quote by an expert who recognizes the bubble? Where is Ben Jones? The National Association of Realtors had this news release on their website. Here is the main highlight "Buyers who purchased a home in the past 12 months reported a jump from 39 percent to 56 percent in agents identifying themselves as RealtorsÂ®, while sellers reported an even more dramatic 23 percentage point gain, from 41 percent to 64 percent. " Update on Wilma and the MBA Convention in Orlando As of 3:00 p.m. EDT, October 20. The MBA Convention will be taking place as scheduled October 23-26. We've been closely monitoring the track of Wilma. The facts being provided by the National Hurricane Center tracks the storm well south of Orlando with a higher probability of landfall between the Florida Keys and Miami which is over 200 miles south of where the convention will take place. At the current time, Orlando is not even listed on the National Hurricane web page with any percentage of probability of the storm being within 65 nautical miles. The higher probability percentages show Key West and Marathon, Florida which are far south of Orlando. Information also indicates it is expected to make landfall Sunday evening and will be out in the Atlantic by Monday morning. We'll continue to monitor the storm's track and if anything changes that would require us to reevaluate convention activities, we will notify members. We look forward to seeing you in Orlando. Perhaps, the bigger threat to the Bankers is the economic storm that is brewing and ready to strike in 2006. I'll be watching to see if at their convention the MBA recognizes the risks of the coming economic storm. The housing bubble has many effects. What are the pluses and minuses of this housing bubble? Industry Week : "Oct. 20, 2005 -- Economists keep predicting a fall in U.S. housing starts, perhaps in hope their prophecy of a bursting bubble will be self-fulfilling. But reality defied the predictions last month, with housing starts for privately owned residences rising 3.4% to a seasonally adjusted annual rate of 2.108 million instead of the 1.5% decrease to 1.98 million units economists generally were forecasting." "Starts for single-family residences were at a seasonally adjusted annual rate of 1.747 million in September, 2.6% higher than the revised August rate of 1.703 million, the U.S. Commerce Department and the U.S. Department of Housing and Urban Development jointly reported on October 19. The September rate for housing in buildings with five or more units was 303,000, an increase of 2.7% from August's revised rate of 295,000." Peter Coy has a wonderful news analysis piece in BusinessWeek. Solid read. 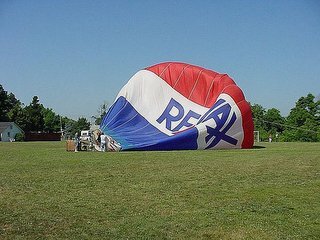 David Lereah who is the chief economist for the National Association of Realtors ( NAR) said that "We've seen a little air come out of the D.C. balloon" Lereah is right this time. The air is coming out prices in the DC area are experiencing very small price declines. Interest Rates continue to rise. The bubble is being squeezed. Yes, I know that have posted so many pictures of Baltimore. Despite all these pictures, to get a true feel for the city one should drive and walk the streets. According to my friend "One reason people are drawn there despite the crime and bad schools is the accessibility to inexpensive culture, bars, and restaurants". While touring some of the open houses in Baltimore my friend ( who lives in Baltimore) chatted with some of the other Baltimore enthusiasts. They reveled in the 'charm' of the city. It quickly become a Baltimore Lovefest. 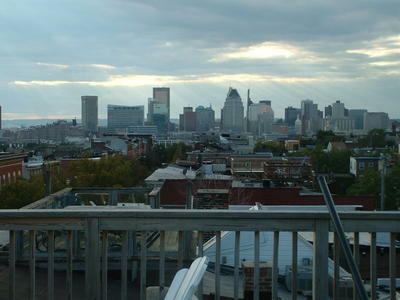 Baltimore is known as 'The Charm City.' Despite, the troubling crime and problematic school system, there is indeed much charm found in Baltimore's neighborhoods. A friend and I went to check out various Baltimore neighborhoods. 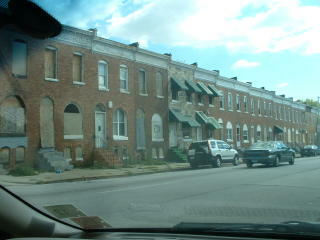 The house on the left is located in Patterson Park. The house is listed for 367,000. The neighborhood is only starting to gentrify. It was fully rehabbed rowhouse which was lovely inside. 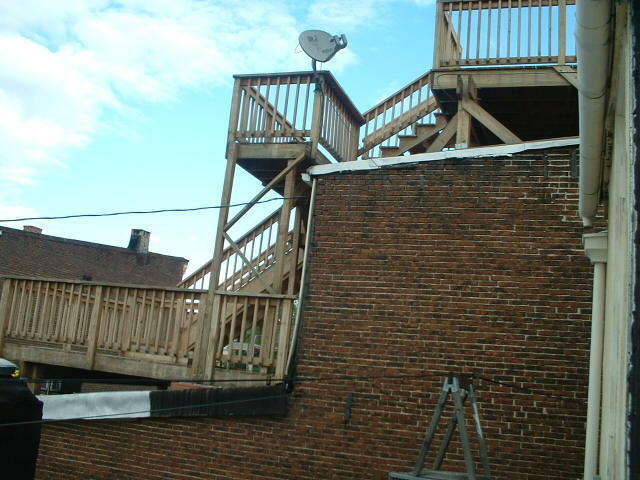 It had 2 Br, 2 bath. A fully finished basement. With the basement space it was about 1500 square feet. It has the obligatory granite countertops and hardwood floor on the first level. The agent showing the house was not the listing agent. He thought that interest rates would continue to rise a bit and then level off at about 6.2%. He said that there was little traffic today. He said that because of the changing market is was 'hard to price aggressively.' 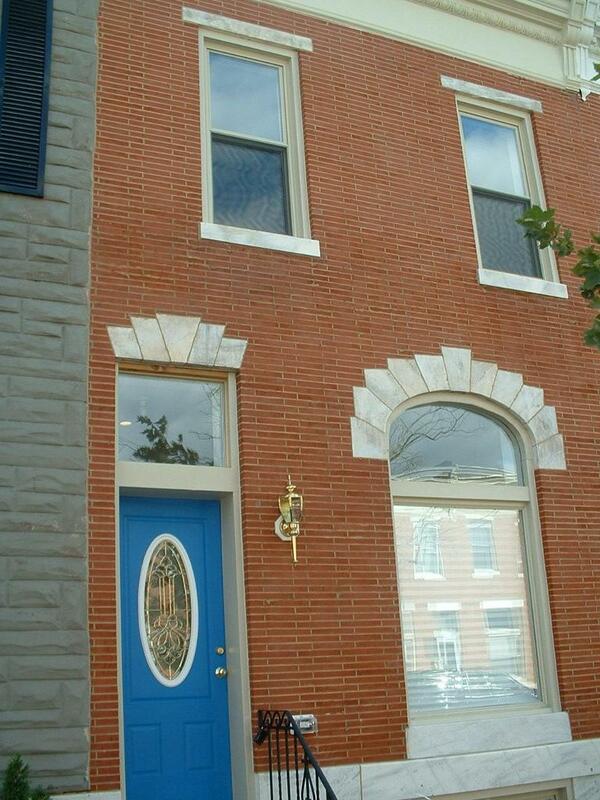 He said 340K would be more realistic ( instead of 367k ) for this renovated rowhouse. Furthermore, "the market is softening." Will it sell for 367K in a reasonable time? Very doubtful. "I'm starting to see price declines," the Realtor declared "Buyers know that the market has changed." 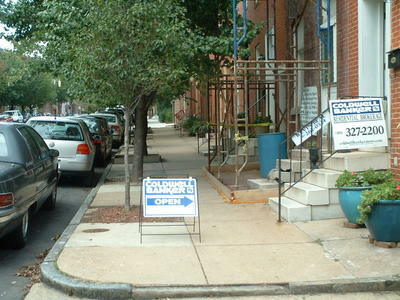 Inventory is rapidly increasing in Baltimore, MD. 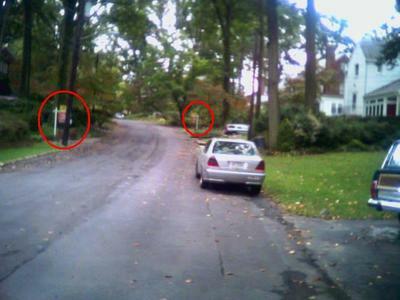 On almost every block in the Butcher's Hill there was at least one house available for sale or rent. Five houses on one block is an incredible amount. 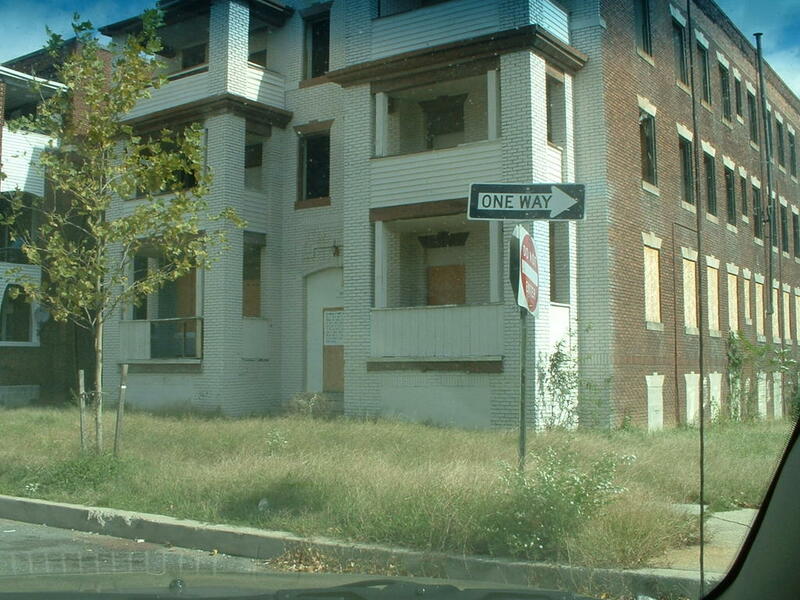 The Realtor admitted that there is much inventory to choose from in Baltimore. 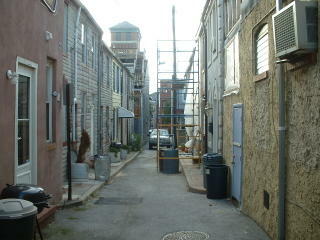 Baltimore, MD is a city of distinct neighborhoods. 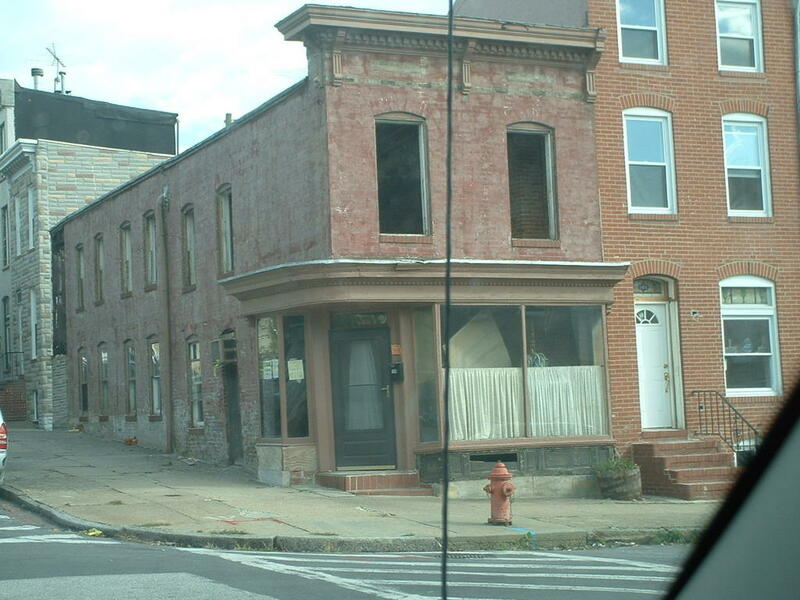 It is city of contrasts, from gentrified Federal Hill to dilapidated Sandtown. In some neighborhoods, 3 br rowhouses in decent condition can be had for 60K while in other areas 60K would get you a doghouse. To find out more information about Baltimore's many neighborhoods check out Live Baltimore. 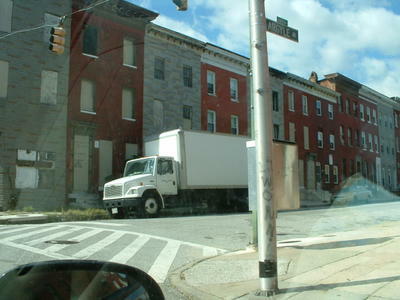 According to Wikipedia: "Baltimore is an independent city located in the U.S. state of Maryland. As of 2005, the population is 636,251, up from 628,670 in 2002." Crime is a large problem. 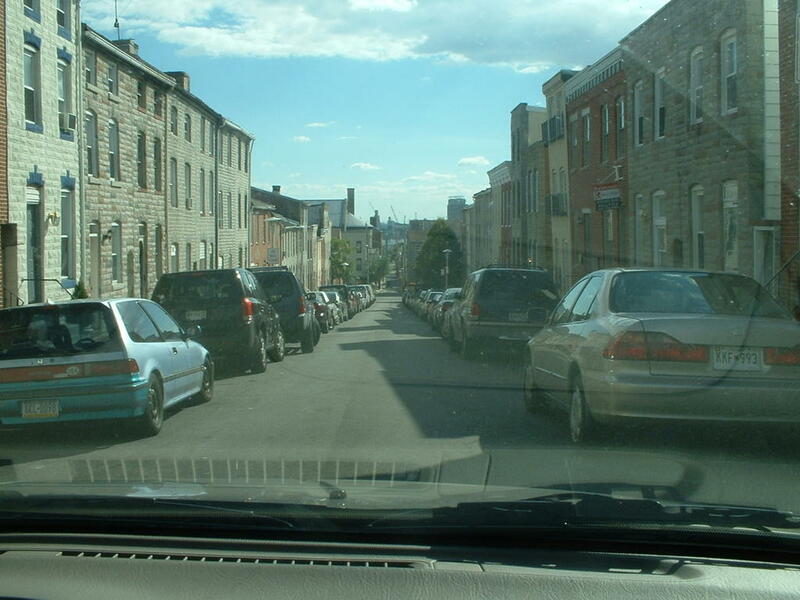 Crime is a large factor in slowing down the gentrification of Baltimore. According to crime statistics, there were 278 murders in Baltimore in 2004. Though this is significantly down from the record-high 353 murders in 1993, Mayor O'Malley had promised during his 1999 campaign and the first two years of his first term that he would bring murders down to 175 a year by 2002 Â a goal that has yet to be met. The murder rate in Baltimore is nearly seven times the national rate, six times the rate of New York City, and three times the rate of Los Angeles. While murders have been relatively static, other categories of crime in Baltimore have been declining. However, Baltimore still has much higher-than-average rates of aggravated assault, burglary, robbery, and theft. Though the crime situation in Baltimore is considered one of the worst in the nation, city officials are quick to point out that most violent crimes, particularly murders, are committed by people who know their victims and who are often associated with the illegal drug trade. The public school system is severely lacking and that certainly puts a damper on prices in Baltimore City. 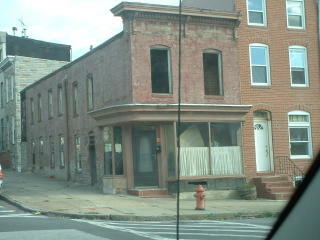 Despite all this in the past 25 years Baltimore has undergone a tremendous amount of revitalizationn. Neighborhoods that used to be run down now have 3br row houses selling for 450K with rooftop decks. 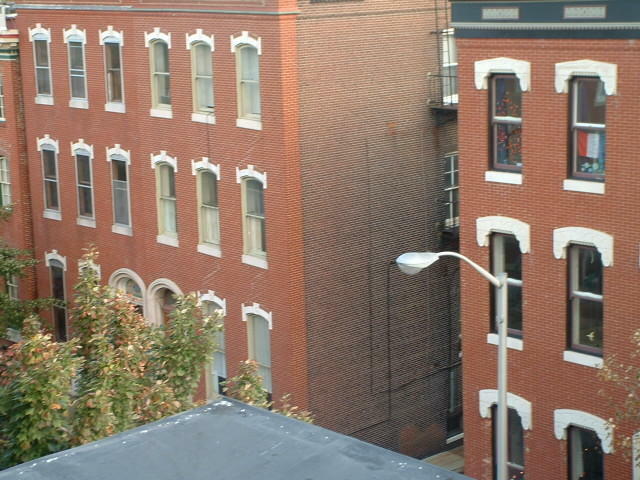 Tomorrow, I am off to Baltimore,to check out various neighborhoods. A friend and I will be visiting open houses there. The Baltimore area has experienced 22% 1yr appreciation and 83% price appreciation in the last 5 years ( OFHEO Report September 1, 2005) . Baltimore is a bubble market. A neat report on my field research will follow. 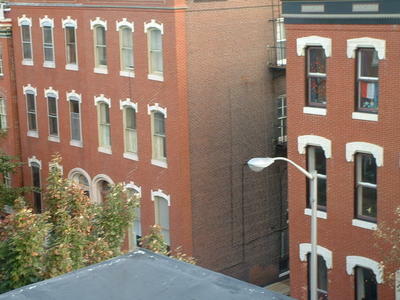 :-) On the left is a picture of house in the Federal Hill neighborhood. In today's Washingpost there is an article titled 'Most Owners Treat Debt Responsibly, Survey Shows' . New consumer research suggests that some of these images are just plain wrong. A nationally representative statistical sample of 1,347 American homeowners polled by Opinion Research Corp. Of Princeton, N.J., from Sept. 22 to Sept. 26 found that while mortgage-burning parties may be out, the overwhelming majority of homeowners have plans to pay off their mortgages within specific timelines, and that a surprising chunk of them -- 25 percent -- already have. What jumps out of the survey is the relatively sober approach most owners are taking to managing their mortgage debts. For example, 38 percent of them say they have already paid off more than 50 percent of their original home financing, including first and second mortgages and equity lines. In answer to another question, 28 percent say they expect to be fully paid off sometime during the coming 10 years. Only 4 percent of all owners say they have no plan or expectations about paying off their mortgage -- they just haven't thought about it -- and just 6 percent expect to extinguish their debts solely by selling the property. Debt levels in the survey were nowhere near as high as preconceptions might suggest. Just 12 percent of respondents reported first and second mortgage totals in excess of $150,000; 19 percent have $75,000 to $150,000 in unpaid home loan debt; and 30 percent have less than $75,000 outstanding. Even in California, the survey found that slightly more than 30 percent of owners are carrying $150,000 or more in mortgage debt. Those numbers don't resemble the irresponsible credit junkies portrayed by some critics and housing-bust doomsayers. Yet the findings don't surprise analysts who keep a close eye on household credit patterns, delinquency rates, foreclosures and debt management. This phone survey was commissioned by Ditech.com a mortgages company. The other issue with this survey was that they asked people about debt and other financial issues. Often, people are unaware of their financial obligations. The survey people did not confirm that people knew the answers to these questions or were telling the truth. Am I a 'sky-is-falling pundit'? I do opine that there will be significant price declines in the bubble markets and that there will be a recession starting next year. In the past five years, lending standards for home mortgages have fallen dramatically. Five years ago many of today's homebuyers would have been laughed out of the bank. Today, the red carpet is rolled out for them. You want a adjustable rate mortgages, option arm, LTV of 103%, with no documentation loan and only have a credit score of 550? Sure. :-) Sign on the dotted line. "It is true, and lots of lenders have been criticized for it, that some very liberal lending has taken place," said Bill Martin, president and chief executive officer of Nevada State Bank. "It has been my 40-year banking experience that departure from traditional lending standards when in a highly competitive market, especially in good times, prove to be invalid whenever there is tightening in the economy. 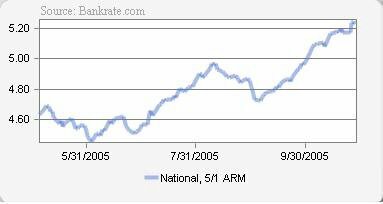 (RISMedia 10/14/05)"
However, once the boom turns into a bust lending standards are inevitably going to tighten. Interest rates are already going up and lending standards have started to tighten ( albeit slowly). As has been noted by many astute commentators the housing bubble has been fueled to a large degree by the credit bubble. The National Association of Realtors (NAR) is forecasting that in 2006 "the median existing-home price to grow by 5.2 percent and the median new-home price to rise 7.1 percent." It is simply not going to happen. There has been such strong national home price appreciation the past few years that an additional 5% in 2006 is unrealistic. The bubble markets will be seeing price declines next year. A national 5% price appreciation for existing homes is not in the cards. In a revised edition of his book, ``Money for Nothing.'' As the housing boom ends, consumers will feel poorer and pare spending, driving up unemployment, he said. U.S. sales of previously owned homes surged to the second- highest level on record and prices reached an all-time high in August, spurred by job growth and interest rates within a percentage point of historic lows, the National Association of Realtors said on Sept. 26. Urban land values in Spain surged 44 percent last year, central bank data show, fueling a spending boom that has helped Europe's fifth-largest economy expand three times as fast as the euro region this year. The U.K. economy, Europe's second-largest, grew at its slowest pace in more than 12 years in the second quarter as the end of a property boom that saw house prices triple in a decade weighed on consumer spending. HBOS Plc, the nation's largest mortgage lender, predicts house prices will fall 2 percent this year after they surged 15 percent in 2004. The Bank of England, which cut its benchmark interest rate to 4.5 percent in August, the first reduction in more than two years, may have to cut rates to below 3 percent ``to prevent the bursting of the housing bubble from causing the economy to stagnate, or decline,'' said Bootle. Moving forward, I trust that we have learned durable lessons about the benefits of fostering and preserving a flexible economy. That flexibility has been the product of the economic dynamism of our workers and firms that was unleashed, in part, by the efforts of policymakers to remove rigidities and promote competition. Although the business cycle has not disappeared, flexibility has made the economy more resilient to shocks and more stable overall during the past couple of decades. To be sure, that stability, by fostering speculative excesses, has created some new challenges for policymakers. But more fundamentally, an environment of greater economic stability has been key to the impressive growth in the standards of living and economic welfare so evident in the United States. Greenspan is about to retire. The next Fed Chairman will have to deal with a very different economic landscape next year. It is well known that one significant factor driving the housing bubble has been strong speculation. This is a speculative episode. Greed drives the speculators to speculate. But, fear is actually a stronger emotion then greed. The greedy speculators have either cashed in or are left holding the bag. But, the cat is out of the bag. The bubble is now widely accepted. 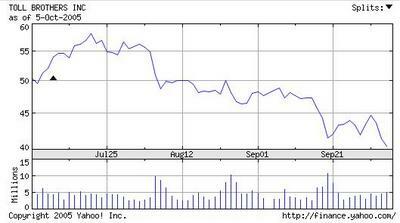 Those left holding, are increasingly fearful that the market has changed. Fear is now rising. Fear leads to selling. The rising inventory in the bubble markets is a key sign. It's looking more and more like June was the peak (witness last week's disappointing new-home sales, pre-Katrina), as various problems begin to surface around the country. That house prices have gone up a lot is not in itself the problem. If they'd risen in an environment where folks were behaving prudently with their financing arrangements (i.e., putting 5%, 10%, 15% or 20% down and taking out 10-, 15- or 30-year mortgages), we might be set up for a dip in prices, as has occurred from time to time. But that's not what we'll witness, thanks to the complete abdication of responsibility on the part of financial institutions, where seemingly no loan was turned down. Thus, those of us who talk about a housing bubble are really referring to a credit bubble. That leads me to Alan Greenspan -- the very man who created the conditions for the stock bubble and the housing bubble -- who (1) claimed that real estate couldn't experience a bubble, (2) actually suggested that folks obtain adjustable-rate mortgages as short-term rates were making their lows, and (3) has been unable to realize that the Fed should have been warning banks about their imprudent lending standards. But if you can't see a problem, you can't try to head it off at the pass -- just as he was oblivious to the bad real-estate loans and junk-bond "investments" that helped precipitate the 1990-91 S&L collapse. Ironically, in 1985, as a paid consultant to Charles Keating's Lincoln Savings & Loan, Greenspan proclaimed that its management was "seasoned and expert" -- with a "record of outstanding success in making sound and profitable direct investments." He later wrote a letter to Edwin Gray, then-chairman of the Federal Home Loan Bank Board, telling Gray to "stop worrying so much," and "that deregulation was working as planned." Greenspan noted 17 S&Ls that had just reported record profits. Within four years, 15 of those 17 institutions were out of business, costing the Federal Savings & Loan Insurance Corp. $3 billion. Just as the masthead of my daily column says "All roads lead to inflation," by my reckoning all financial problems lead back to Greenspan. I have not penned a Greenspan rant in some time. Given all the focus on his speech last week -- and the fact that he's getting ready to ride off into the sunset -- I will have a special follow-up column tomorrow to reprise his comments. Stay tuned. But the best quote from the article is "Against this backdrop of abuse, the story quotes one brave Columbus appraiser named Lori Austin: 'Nobody's looking out for the buyer.' Well, that, in fact, is true. No one is looking out for the buyer." The Mortgage Bankers Association (MBA) today released its Weekly Mortgage Applications Survey for the week ending September 30. The Market Composite Index — a measure of mortgage loan application volume – was 713.5, a decrease of 1.1 percent on a seasonally adjusted basis from 721.2 one week earlier. On an unadjusted basis, the Index decreased 1.2 percent compared with the previous week and was down 1.8 percent compared with the same week one year earlier. The seasonally-adjusted Purchase Index decreased by 1.9 percent to 473.8 from 483.1 the previous week whereas the Refinance Index increased by 0.1 percent to 2107.4 from 2106.6 one week earlier. Other seasonally adjusted index activity includes the Conventional Index, which decreased 1.8 percent to 1068.9 from 1088.8 the previous week, and the Government Index, which increased 11.4 percent to 120.3 from 108.0 the previous week. The refinance share of mortgage activity increased to 44.5 percent of total applications from 43.9 percent the previous week. The adjustable-rate mortgage (ARM) share of activity increased to 29.8 percent of total applications from 28.8 percent the previous week. The average contract interest rate for 30-year fixed-rate mortgages increased to 5.94 percent from 5.85 percent on week earlier, with points increasing to 1.21 from 1.19 (including the origination fee) for 80 percent loan-to-value (LTV) ratio loans. The average contract interest rate for 15-year fixed-rate mortgages increased to 5.55 percent from 5.44 percent one week earlier, with points decreasing to 1.15 from 1.23 (including the origination fee) for 80 percent LTV loans. The average contract interest rate for one-year ARMs increased to 5.13 percent from 5.02 percent one week earlier, with points decreasing to 0.98 from 1.01 (including the origination fee) for 80 percent LTV loans. The difference between the average contract interest rate for 30-year fixed rate mortgages and for one-year ARM’s decreased to 0.81 basis points. This is the lowest spread since March 16, 2001. The profit margins for the mortgage companies are being squezed. Interest rates are rising. The hiss is getting louder. We face a crisis in practical living arrangements as the infrastructure of suburbia becomes hopelessly unaffordable to run. How will fill our gas tanks to make those long commutes? How will we heat the 3500 square foot homes that people are already in? How will we run the yellow school bus fleets? How will we heat the schools? What will happen to the economy connected with the easy motoring utopia - the building of ever more McHouses, WalMarts, office parks, and Pizza Huts? Over the past thirty days, with gasoline prices ratcheting above $3 a gallon, individuals all over America are deciding not to buy that new house in Partridge Acres, 34 miles from Dallas (or Minneapolis, or Denver, or Boston). Those individual choices will soon add up, and an economy addicted to that activity will be in trouble. The housing bubble has virtually become our economy. Subtract it from everything else and there's not much left besides haircutting, fried chicken, and open heart surgery. Another obstacle to clear thinking I refer to as the Las Vegas-i-zation of the American mind. The ethos of gambling is based on a particular idea: the belief that it is possible to get something for nothing. The psychology of unearned riches. This idea has now insidiously crept out of the casinos and spread far-and-wide and lodged itself in every corner of our lives. It's there in the interest-only, no down payment, quarter million-dollar mortgages given to people with no record of ever paying back a loan. It's there in the grade inflation of the ivy league colleges where everybody gets As and Bs regardless of performance. It's in the rap videos of young men flashing 10,000-dollar watches acquired by making up nursery rhymes about gangster life - and in the taboos that prevent us from even talking about that. 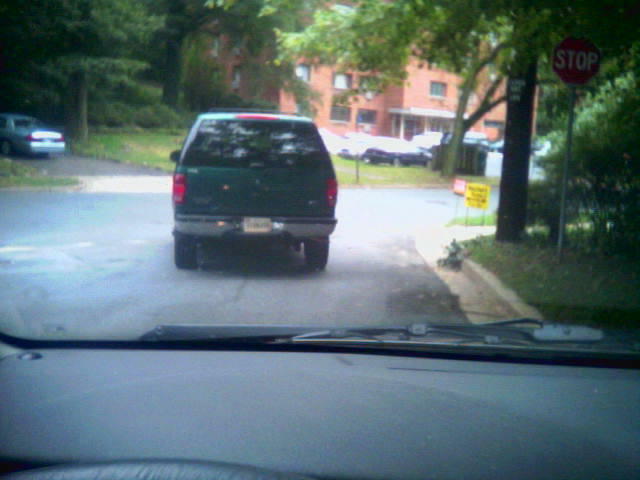 It's in the suburbanite's sense of entitlement to a supposedly non-negotiable easy motoring existence. The idea that it's possible to get something for nothing is alive and rampant among those who think we can run the interstate highway system and Walt Disney World on bio-diesel or solar power. 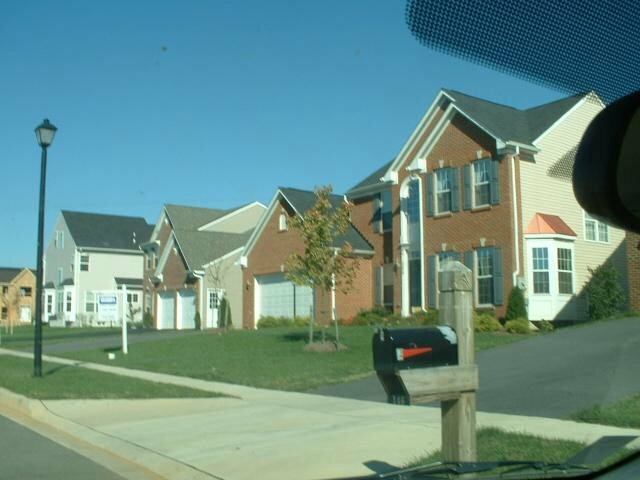 There are a bunch of single family homes (SFH) available for purchase on Woodland Drive near the Beltway (I-495). In the above picture, the sales signs for 9500 and 9503 Woodland Drive are visible. 8300 Hartford which is just down the block from 8406 Hartford, which I previously blogged about, was just listed at 599,000. It is a lovely house. The MLS ID is MC5402312. 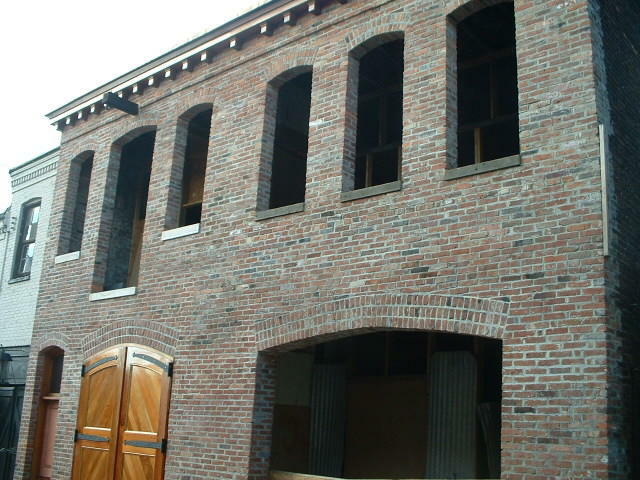 The house was built in 1979. 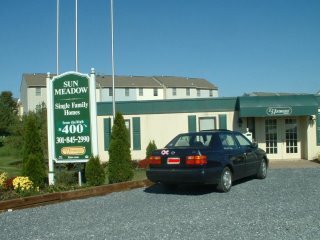 The owner is leaving because of a "job transfer" to Philadelphia. According to the realtor the "market is generally changing" and is "much more sane" then it was in the spring. He agreed that inventory is "increasing." The realtor has been in the business for 5 years. One of the house browsers commented that after seeing the 8406 Hartford Avenue house ( down the block) commented that "No one would buy the other house if they saw this one." Will it sell at 599K in a reasonable time? Possibly. 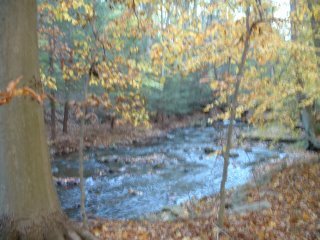 Today, I went to visit a house located at 8406 Hartford Avenue in Silver Spring, MD. 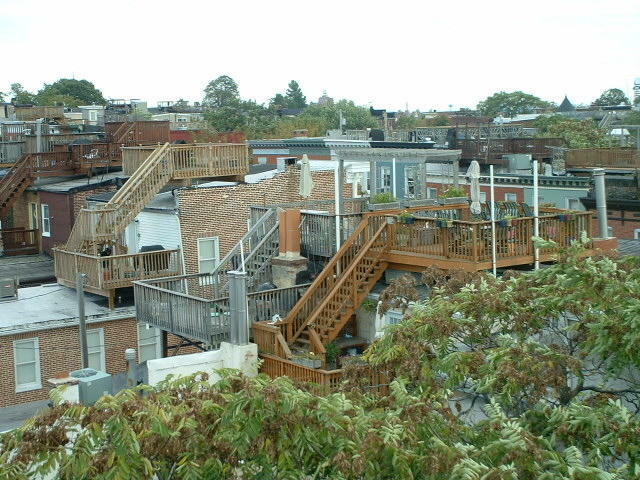 It is inner suburb of Washington, DC. A sort of nice middle class neighborhood. The house was originally listed at 679K. It was reduced to 649,000, and then to 629,000. The open house was happening between 1 - 5pm and when I showed up at 3pm only 5 people has signed in at the sign in sheet. Will it sell at 629K? As I was leaving, one of the browsers walked ahead of me and jumped into their SUV. If he buys this house at 629K and keeps his SUV what would his monthly costs associated with these two material objects be? Ok. For those two items we are looking at 50,000 a year. D*mn. ÂThat is spreading the wealth of housing returns, with a natural easing of appreciation in areas following a period of extraordinary price growth. Even after slowing in a given area, prices typically have continued to rise faster than historic norms." David Lereah is correct about the idea of a 'rolling boom. After this unprecedented housing bubble there will be significant price declines in the bubble markets. The soft landing scenario is not in the cards. A 20 - 30% inflation adjusted price declines will occur in most of the bubble markets. "People who cashed out three or four years ago intending to buy back in at a lower price are still waiting," says James Hamilton, president of the California Association of Realtors and manager of real-estate brokerage Re/Max Execs in Redondo Beach, California. He adds that California housing prices are expected to increase 10 percent in 2006. "If you arenÂt moving somewhere where the cost of living is lower, big mistake." James Hamilton is dreaming if he thinks home price appreciation will be 10% in 2006. I am willing to bet him 5 to 1 that home price appreciation in California will be less then 5% in 2006. 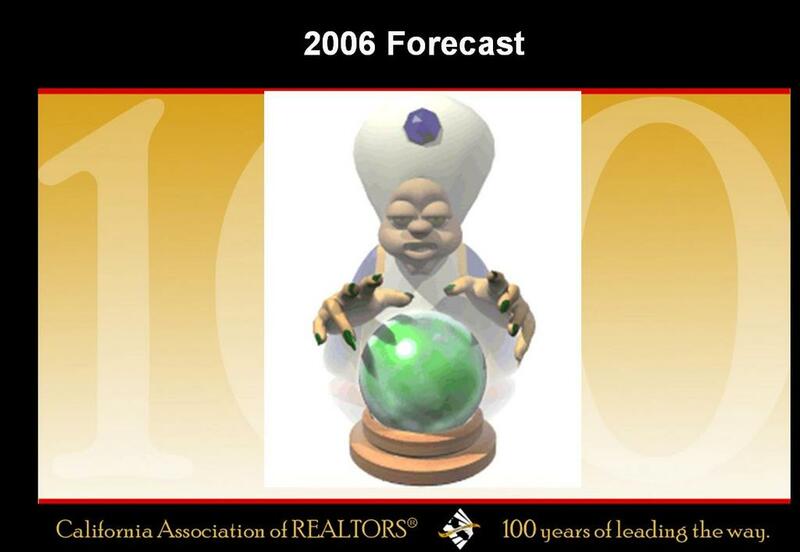 The California Association of Realtors ( CAR) has this tremendous powerpoint presentation. Is that froth I see emanating from the green bubble? The housing boom IS a speculative episode. The speculative boom will inevitably turn into a bust. Significant prices will occur in the bubble markets. About a third of home purchases in 2005 were either for investment or bought as second homes. There is no shortage of housing units. There were about 2.2 million housing units constructed last year ( US Census Bureau) and about 1.6 million are need to house a growing population and 300,00 are need to replace existing stocks that becomes uninhabitable. That leaves an extra 300,000 units. Inventory is rapidly increasing in the bubble markets. 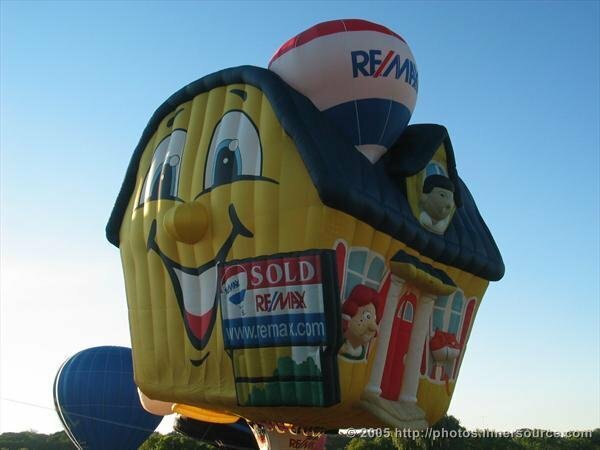 A significant number of home sellers have already lowered expectations in the bubble markets. Back on September 11, I posted about a junky house in my neighborhood. 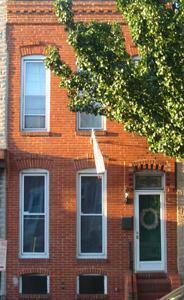 In September, it was listed at 489,000 which was a reduction from the original listing price of $545,000. Now, it has been reduced again to 485,000. The MLS ID is #MC5402435 . Keep on falling. I should call the realtor and suggest a listing for 449,000. 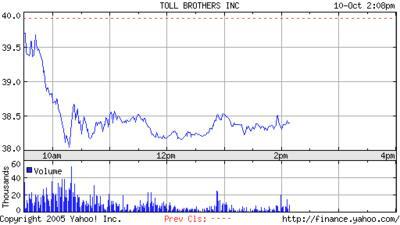 Graph showing the stock of a leading luxury home builder: Toll Brothers. I'll let the graph speak for itself. 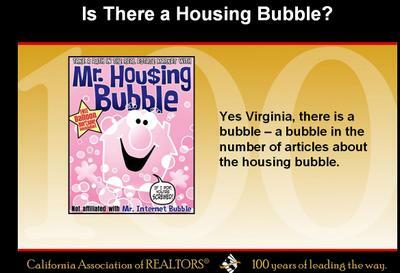 Here are the highlights from The Nation article titled Pop Goes the Real Estate Bubble. The Big One isn't the long-predicted California earthquake or even a hurricane named Katrina. The genuine big one will arrive with a deafening pop, the sound of the real estate bubble bursting. In the past few years there have been plenty of false sightings, but now comes something truly ominous: a 13 percent drop in Manhattan real estate prices in a mere three-month period ending October 1. As if that were not bad enough, more unsettling news of the same nature is reported in Boston, Washington and San Francisco, the places that have led the national upward zoom in real estate prices for the past several years. What is their source for the 13% drop in prices in Manhattan in a three month period. ? I would not call the news from the markets "unsettling news" because we need price declines in the bubble markets. The huge price appreciation that has occurred in the bubble markets has distorted the US economy. In the short term it is 'good,' but in the long term the housing bubble is damaging. By taking home equity loans and cashing out--that is, refinancing the mortgage--every time their houses went up in value, the millions made billions. According to Federal Reserve chairman Alan Greenspan, they made $600 billion last year on the hypothetical appreciation of their properties. That adds up to about 7 percent of their spendable, after-taxes income. That's twice as much money put into people's hands as Bush's tax cuts. Nice comparison on those big numbers. :-) $600 billion is a huge number. That is about $2000 for every man, women and child in the US. Not to mention the federal debt / deficit, the effects of offshoring, and the trade deficit. A recession is indeed coming in the next 1.5 years. Executives in the industry have sold off almost a billion dollars' worth of stock in their own companies this year, something they would not be doing if they thought the arrows were pointing upward. Great point. Big red flag as insider's have sold a huge amount of stock. If housing does do its long-awaited plop, there are some pluses. Savings may go up, we'll buy less from foreigners and owe them less, we'll be better able to pay some of our bills. Right on. The roughly $750 billion annual trade deficit must be reduced, as it is entirely unsustainable. The end of the housing bubble will help contrinute to a shrinking of the trade deficit. The flippers over at CondoFlip.com want to inform us all that 'Bubbles are for Bathtubs.' CondoFlip is headquarted in Miami Beach, FL. Go Figure. CondoFlip is still under the patent pending catgory. Will CondoFlip recieve their patent before or after the bubble? Some new links have been added to other housing bubble related sites on the right column of the page. Check them out. 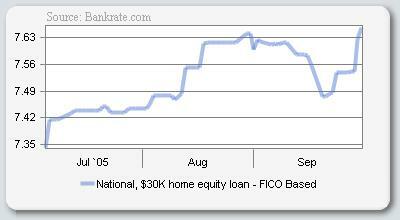 Interest rates on home equity loans are rising. 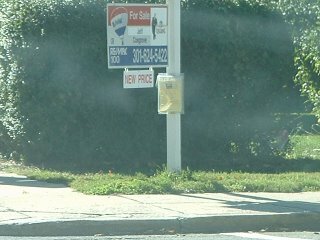 The ATM machines located in many homes across Ameridebt are charging higher fees. Consumer spending will be curtailed. The stagnation period that was the norm in most bubble markets is no longer the norm. Small price declines are now the norm in the bubble markets. The housing boom will go bust in 2006. 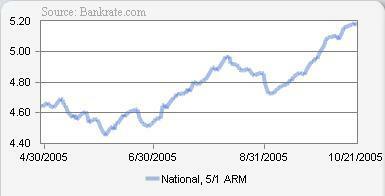 Price declines in most bubble markets are expected to be between 3 - 10% ( inflation adjusted) in 2006. The smart money has already exited. There will be much pain for those who are inevitably going to be losing money. In every speculative episode those holding the bag will get burned. It won't be pretty. The housing bust has started.